MS symptoms are different for everyone and may change from one flare to another, but there are triggers everyone with multiple sclerosis should be aware of. “Although a flare or relapse can occur without any warning, certain triggers are common,” says Matthew McCoyd, MD, a neurologist, assistant professor, and associate neurology residency program director with the Loyola University Health System in Illinois. Stress. Emotional stress is part of having a chronic disease like MS and can lead to the common MS symptom of depression. Stress can also lead to other MS symptoms, such as fatigue and confusion. An important aspect of MS treatment is creating a support network that may include loved ones who can physically help out, as well as a support group that can provide emotional strength. You may also want to consider a stress-relieving activity like meditation. Infection. 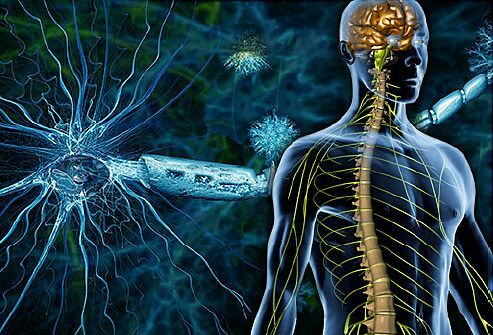 Infections are the cause of about one-third of all flares of MS symptoms. “Urinary tract infections are common causes because some people with MS have reduced bladder function,” says Dr. Conway. But any infection that weakens the immune system, like a cold or the flu, can cause a flare. So wash your hands frequently, get a yearly flu shot, and avoid being around people who are sick. Heat. An infection that leads to a fever is especially troublesome to those with MS since increased body heat is a common trigger. “In the old days, a hot-bath test was one of the ways doctors diagnosed MS,” notes Dr. McCoyd. MS symptoms, especially tingling, are usually worse in the summer because of the heat. Getting into air conditioning or taking a cool shower usually helps reduce heat symptoms. Some people also get relief from wearing a vest filled with cool water. Not all MS symptoms need to be treated. Tingling, fatigue, and mental fog generally go away on their own once the trigger is removed. However more severe MS symptoms that affect your ability to function normally, such as severe weakness, poor balance, or loss of vision, do need to be treated, usually with a short course of steroids for severe MS symptoms. “Flares and triggers are different for everyone with MS,” Conway notes. “Each person should learn to identify their own individual triggers.” If you or a loved one has multiple sclerosis, learning as much as you can about MS, getting help and support, making healthy lifestyle choices, and avoiding common triggers will go a long way toward living well with this chronic disease. Always let your doctor know about any new MS symptoms or any MS symptoms that last for more than a day and are interfering with your ability to function normally.